There are lots of versatile things in the new Autumn/Winter catalogue. The Cheerful Tags Framelits Dies and co-ordinating stamp set Here's to Cheers is no exception. You can make Bottle Tags for boozy gifts, Tags for presents and Tags as Toppers for boxes and cards too. 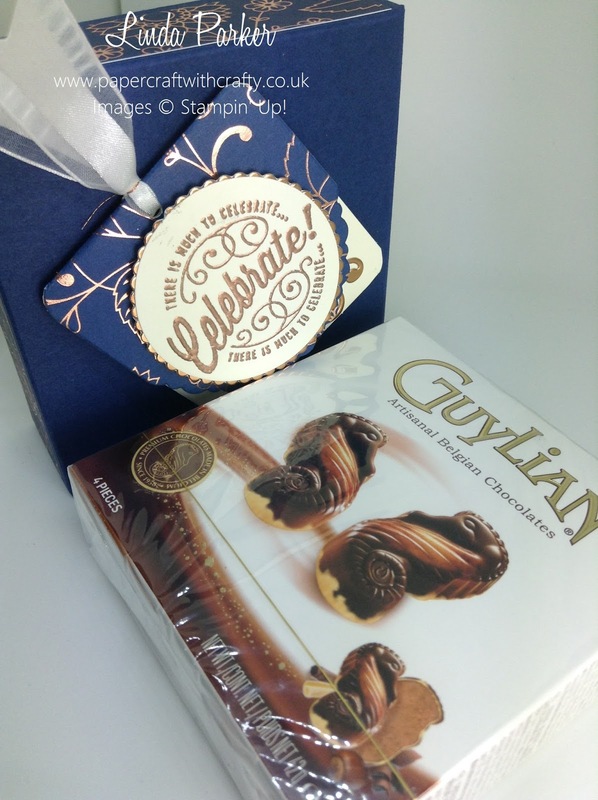 That is how I chose to showcase the Bundle with this attractive chocolate box gift wrapper for a 42g mini box of Guylian chocolates. Shown below in two colourways both using Night of Navy as the base colour, one box uses DSP from the beautiful Petals and Paisleys Specialty Design Series Papers with a dash of Very Vanilla, and the other one is made with the Affectionately Yours Specialty Designer Series Papers with a touch of Flirty Flamingo card stock. 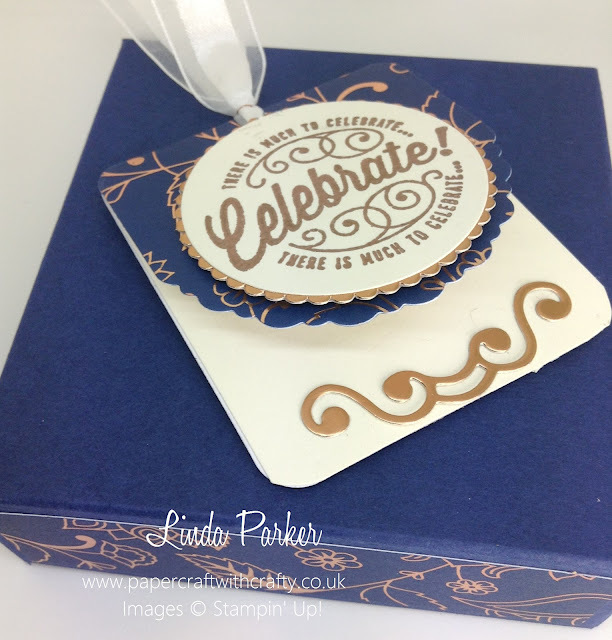 I kept the box fairly plain, just adding some gorgeous decorative papers to the box sides and then adding the Tag Topper using the same DSP. Note the beautiful Copper embossed foil on both DSPs, and also the new Copper Stampin' Emboss Power. Copper is very on trend this season. This little box is a gorgeous way to make an inexpensive gift look a little more special. Perfect for Teachers' Thank You gifts for example. Or even Bridal Showers ? Anyway, I hope you like what you see. I have made a video tutorial which gives your step by step instructions. Thank you very much for dropping by and having a look. Beautiful as always. I love your videos, and hope you continue to do them. Blessings!